Back problems are a common ailment these days. We sit for hours at our desks, hunched over our computers or tapping away on our smartphone screens. Bad posture and too little exercise often cause muscle tension, inflammation, and spinal misalignment. On the other end of the extreme, we head out for adventures on our mountain bikes or on the jogging trail and we injure ourselves. (This often happens after a week of sitting.) In this post we are going to discuss in depth the most common Inversion Table Benefits. After those problems the next step is often the doctor. Usually, they’ll suggest more exercise, better health, a better diet. Often, they’ll prescribe medications, injections, heat therapy, or cold therapy to calm things down. In extreme situations, they may suggest surgery. Pills and surgery. One seems like a bandage that’s being used to cover up an underlying issue and the other is pretty frightening to consider. Drugs offer relief, but they come with side effects and the risk of addiction. Surgery comes with its own set of risks, in addition to cost and lengthy recovery time. Injections are a possibility, but steroids can destroy cartilage and create more problems down the road. In addition to this, they’re only effective for a limited amount of time before they must be repeated. Isn’t there a better way to treat the underlying cause of back pain without ending up on an operating table? Surely, there’s something we can do to help our bodies heal more naturally. It may sound surprising to you, but the only thing you need to do to heal your back is to hang out. Specifically, you need to hang upside down. While this may sound like something that eccentric Hollywood actresses do in order to reverse aging and fight off the effects of gravity, the benefits of inversion table therapy are real. 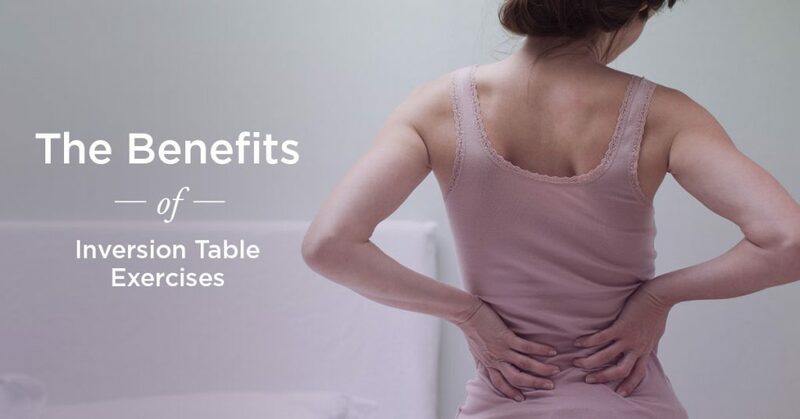 If you’re currently holding a bottle of pain pills while looking at a back surgery brochure, let’s discuss some of the ways that using an inversion table can help put you on the road to recovery. Simply put, we’re hard on our bodies—either by not exercising them enough or by performing exercise that is high-impact and hard on our muscles and joints. While we might not notice it, gravity is pretty tough on us, as well. It helps to weigh us down, impacting our spine, weighing down muscles, inhibiting circulation, and causing our lymphatic systems to work harder. The result of all of this? Spinal discs that slip out of alignment. Sore, inflamed muscles. Nerves that get pinched, causing everything from pain to tingling and numbness in our backs, arms, and legs. Our lymphatic and circulatory systems are sluggish, so our muscles struggle to recover after exercise. We feel tired. We’re in pain. Many people find relief from a variety of conditions by introducing inversion table therapy into their routine. increased lymphatic flow and drainage. After hearing about the benefits of inversion table therapy, some people have tried it as a last-ditch effort…and have been able to avoid having back surgery and live happily for the rest of their lives. How does inversion therapy benefits you? It seems too simple; how do you get all of these benefits from hanging upside down? Many of the benefits of inversion table therapy come from spinal traction, otherwise known as spinal decompression. As we go about our daily lives, gravity weighs heavily on our bodies, pressing our spinal disks down. This compresses them and can greatly exacerbate any injury, inflammation, or dysfunction that’s currently going on. If you have a herniated disc that’s impinging on a nerve, for instance, it likely feels worse as you go about your day and feels slightly better when you lay down and take the weight off of it. Simply laying down removes a great deal of the gravity pressure. Even better? Inversion therapy. When you invert even slightly, you remove not just the weight of the gravity that’s been pressing down on your nerves and spinal discs—you reverse it. You allow your spine to decompress and stretch out. Discs that have been crushing against each other or irritating nerves are suddenly stretched apart. This provides an immediate sense of relief. It can allow slipped discs the ability to move back into the appropriate place. Your spinal discs will also be better able to lubricate themselves as the jellylike material that sits between each one ceases being pressed upon and shoved out from its proper position. Just as your spine is working hard to fight the forces of gravity, your circulatory system is, too. With every beat, your heart must pump blood to and from every part of your body—including far-flung body parts like your feet and toes. By inverting, you can imagine the load you take off of your heart as blood that’s languishing in your extremities is allowed to drain back towards the core of your circulatory system. Improving your blood flow is one of the most important inversion table benefits because all of your tissues need blood to repair injuries and damage. Damaged ligaments that are pulling your spine out of alignment can better heal when they can receive fresh, oxygenated blood. The same holds true for injured or inflamed muscles. Better blood flow helps them repair better and faster. Our lymphatic system is an important part of keeping our bodies healthy, as well as repairing illness and injury, because it helps rid our bodies of waste and toxins. Sometimes, though, lymph fluid doesn’t flow as it’s supposed to and pools up—especially in our extremities. For many people, this results in swollen ankles and feet. Exercise, lymphatic massage, compression bandages and stockings can be helpful in moving lymphatic fluid out of those areas. Better lymphatic flow and drainage, however, is another one of the benefits of inversion table therapy. Since use of an inversion table typically places the user’s feet above the rest of their body, this can assist drainage of excess lymph fluid from ankles, legs, and feet. This, when combined with movement to help continue move lymphatic fluid through the system, can help the body rid itself of toxins. Many people resort to injections and painkillers to cope with chronic joint pain. The main weight-bearing joints of the body such as the knees and hips are particularly prone to pain, especially as people age. Steroid injections into the knees provide relief over a period of months, but they can do damage if they are used repeatedly, as steroids can break down the cartilage that helps cushion the knee bones. Inversion therapy helps relieve pressure on knee and hip joints, but it also does more. While the joints are decompressed, the fluid in between the joints is able to move back into place. This fluid helps feed and lubricate the joints. Surrounding ligaments and muscles also get a break, allowing them to relax and heal. Improved circulation helps them repair any damage that’s been done. Although the immediate results may seem short-lived once you flip upright and gravity resumes its pull on your body, the benefits of inversion table therapy that is performed regularly over a period of time are long-lasting and even permanent. People with injuries or chronic pain conditions report that inversion therapy helped them heal or greatly reduce the pain they experience from day to day. It’s understandable that you might be skeptical about the many inversion table benefits if you’ve never tried one before. For this reason, it’s a good idea to do a quick search of local chiropractors and practitioners who use inversion therapy on their patients. Make an appointment, go in and discuss it with them. Make sure to discuss any underlying health issues you have, especially if you suffer from glaucoma, hypertension, or heart disease—as these issues can be exacerbated by inversion therapy. Once you have a consultation, you’ll be able to kick of your inversion therapy in-office to get a feel for how your body will respond to it. If you’ve started inversion therapy under the care of a chiropractor or physical therapist, you’ve experienced the Inversion Table Benefits firsthand. Once you start to feel better, you’ll likely want to continue inversion therapy in the comfort of your own home. The good news is that you can easily find a wide variety of inversion tables online. Take a look at these reviews to help guide you to the perfect inversion table for you. There’s no easier way to stick to your therapy schedule than to be able to do it on your own time, regardless of the day of the week or time of day. After you learn how well inversion therapy works, you’ll be hooked for life. Next Article Inversion Chair Therapy: Is It Right for You?